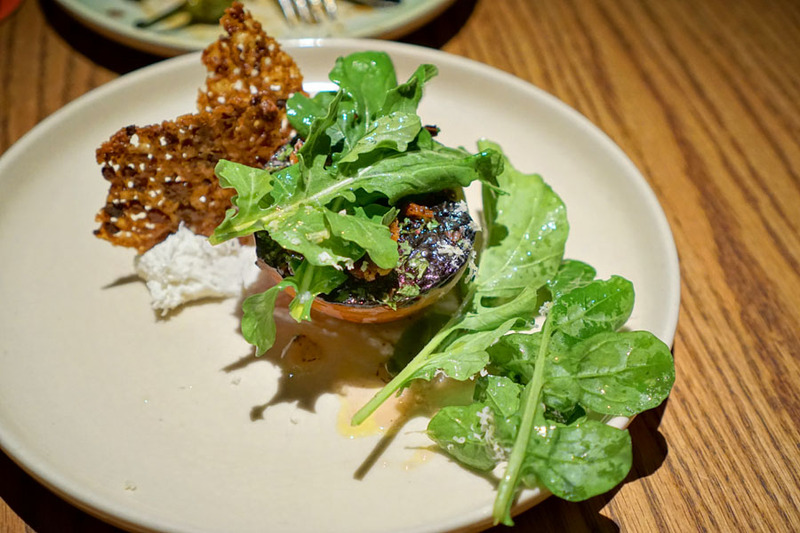 As of late I seem to be doing more than my usual share of dining in Hollywood--which is surprising even to me--and my latest meal brought me to April Bloomfield's beleaguered Hearth & Hound. The restaurant sits in the former home of Cat & Fiddle, an English-style pub that was originally opened in Laurel Canyon in 1982 by British musician Kim Gardner (at the site of the current Pace). Cat & Fiddle moved to its Sunset location in 1985, where it remained for almost 30 years before closing in December 2014 due to lease issues (it ended up relocating to the former home of Mud Hen Tavern). Meanwhile, the space was acquired by Bloomfield and business partner Ken Friedman (with Bill Chait in the mix, curiously), and they opened the place up for business last December. About the Chef: Bloomfield was born in 1974 in Birmingham, England. Her mother worked at home painting porcelain bomboniere for Halcyon Days Ltd, while stepdad was an engineer; neither were foodie types. She initially wanted to become a police officer, but ended up missing the application deadline for the cadet program. With that option off the table, she decided to follow in her sister's footsteps and go to catering college. Bloomfield ended up enrolling at the Birmingham College of Food, Tourism and Creative Studies (now University College Birmingham), and quickly fell in love with the craft. Her first industry gig was that of a dishwasher at a local joint called The Mill, and after graduation, she started working at a nearby Holiday Inn. Six months later, she left for London and secured a commis position at Rowley Leigh's Kensington Place, a role she stayed at until 1993. Bloomfield's next job was at the Michelin House's Bibendum, under Simon Hopkinson. From there, she relocated to Northern Ireland and worked at Paul Rankin's Roscoff in Belfast, the first restaurant in the country to be awarded a Michelin star. She eventually returned to London, cooked for a bit at Kensington Place again, then went over to The Brackenbury. In 1999, a friend got Bloomfield a position at the iconic The River Café, where she served as sous for co-owners Rose Gray and Ruth Rogers. Four years later, upon Jamie Oliver's recommendation, she was recruited by Mario Batali to open a restaurant in New York with him and music industry veteran Ken Friedman. She thus moved to the US, and to familiarize herself with American ingredients, worked for a few months at the illustrious Chez Panisse (who knows, maybe she cooked for me during my first visit to the restaurant in 2003). The Spotted Pig opened in the West Village in February 2004; it was a smashing success, and would help kick start the gastropub movement Stateside. 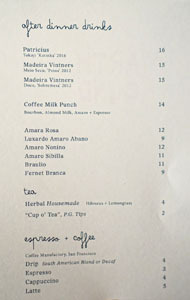 The restaurant secured a Michelin star in the first NYC edition of the guide in 2005, and managed to keep it until 2016. Bloomfield was named one of "America's Best New Chefs" by Food & Wine in 2007, and was deemed a "Best Chef: New York City" semifinalist by James Beard from 2008 to 2010. She was then a "Best Chef: New York City" nominee from 2011 to 2013 before finally winning in 2014 (Friedman, meanwhile, was awarded "Outstanding Restaurateur" honors by Beard in 2016). Given how well The Spotted Pig was doing, expansion was a must. 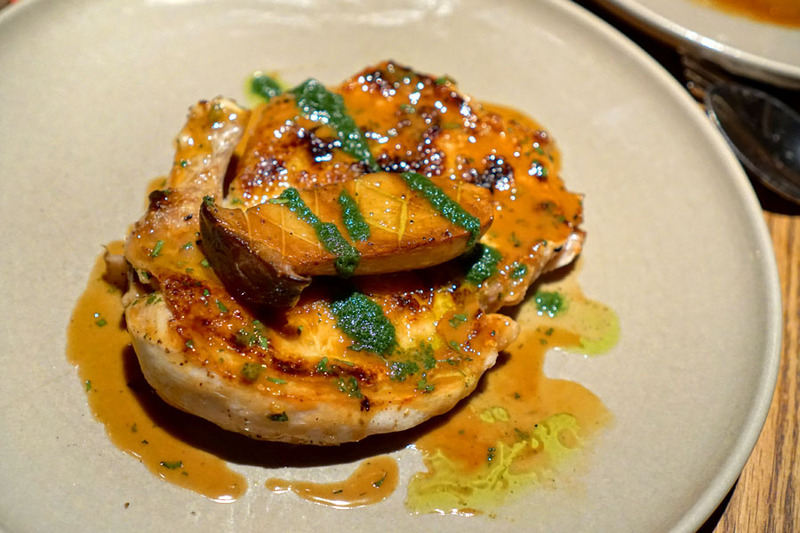 She, Friedman, Batali, and Joe Bastianich opened The John Dory at the end of November 2008, though the place would prove to be short-lived, shuttering the next year. 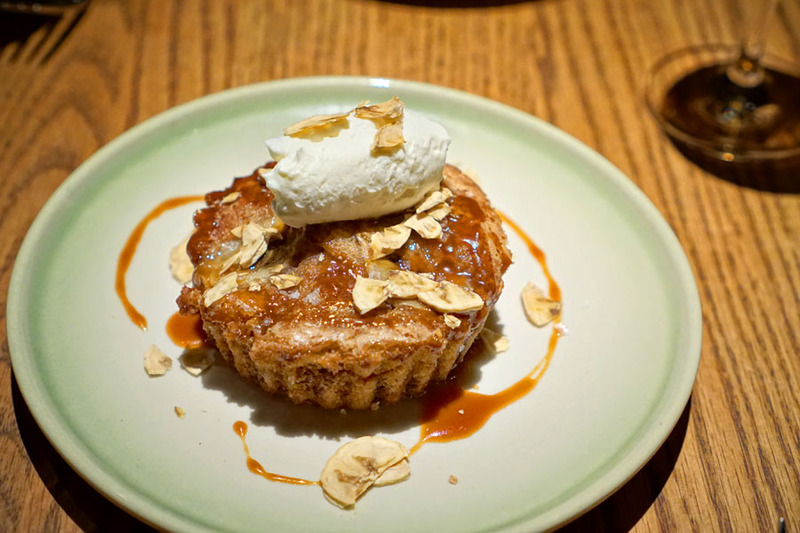 Bloomfield and Friedman then teamed up to open The Breslin at the Breslin Hotel (now Ace Hotel) in 2009; the steakhouse was Michelin-starred the next year. This was followed by The John Dory Oyster Bar in 2010, in the same hotel. The Chef released her first cookbook, A Girl and Her Pig with JJ Goode, in March 2012. Bloomfield/Friedman also began working with the Pod 39 Hotel in 2012, and launched Salvation Taco at the property in December that year. 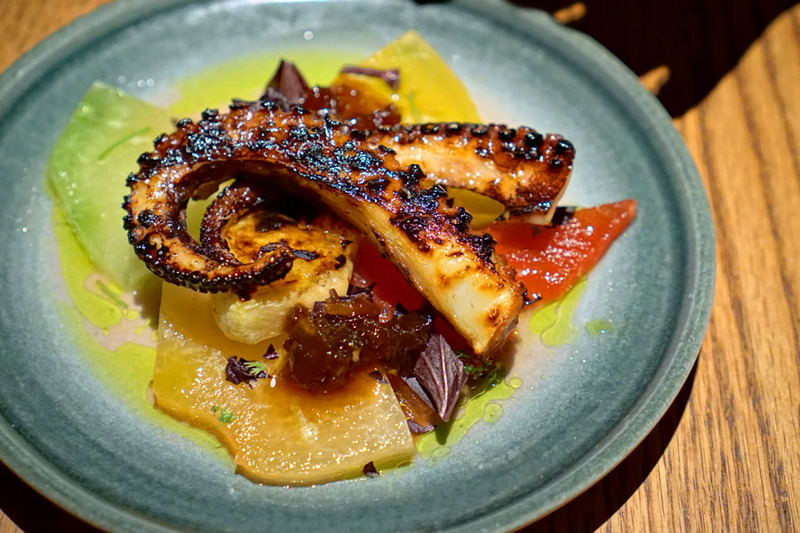 The pair then expanded their business to the West Coast, and, along with Chef/Partner Josh Even, took over the longstanding Tosca Cafe in San Francisco. They renovated the storied place (founded in 1919) and reopened in October 2013 to considerable fanfare. A second cookbook, A Girl and Her Greens, dropped in April 2015, while February 2016 had the opening of Salvation Burger inside the Pod 51 Hotel (it didn't last long, closing the next July). In April 2016, Bloomfield (sans Friedman) teamed up with Chef Tom Adams and purchased Coombeshead Farm in Lewannick, Cornwall, England, which remains her only project in the UK. Meanwhile, that October, she and Friedman debuted White Gold Butchers with partners Jocelyn Guest and Erika Nakamura (ex-Lindy & Grundy). The two then focused their efforts on LA, and would open The Hearth & Hound in December 2017. However, in an unfortunate bit of timing, just days later news broke that Friedman had a history of sexually harassing his employees (and that Bloomfield didn't do enough to curb his behavior). He soon took a leave of absence, but that didn't stop a wave of departures from the restaurant group, which included three key chefs: The Spotted Pig's Katharine Marsh, The Breslin's Christina Lecki, The John Dory's Charlene Santiago. 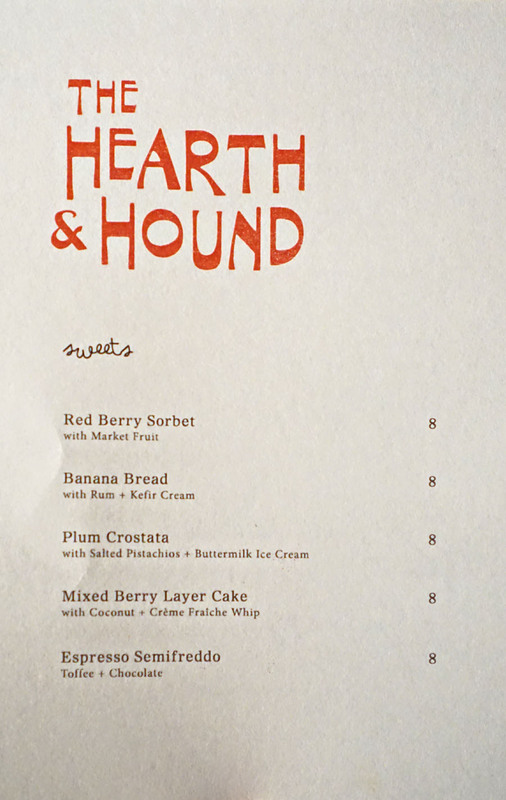 The Hearth & Hound, meanwhile, lost its head and pastry chefs as well as its wine director. In March 2018, Guest and Nakamura decamped from White Gold, while Bloomfield and Friedman would relinquish their role in Salvation Taco in May. Tosca Cafe's Josh Even and Business Manager Dana Katzakian also departed in May, after unsuccessfully trying to purchase the restaurant from the two principal partners. It took until mid-2018 for Bloomfield and Friedman to unravel their holdings. The former took over Tosca Cafe and Hearth & Hound here in California, and remained chef at the two restaurants inside the Ace Hotel. Meanwhile, Friedman was given The Spotted Pig and White Gold (White Gold, however, ended up closing just two months later). And in an interesting twist, in June it was announced that Prune's Gabrielle Hamilton and Ashley Merriman would be joining the team at The Spotted Pig. However, this was met with a good amount of outrage, and the deal was eventually nixed after the parties couldn't agree to financial terms. Currently, Friedman is supposedly being investigated by the New York attorney general and sued by the owners of the Ace for financial shenanigans, while word is that The Spotted Pig isn't doing nearly the numbers it did in happier times. The 1927-era building was redone by Roman and Williams, the firm behind The Breslin/John Dory as well as The Exchange here in LA. The dining room is a warm, homey space, centered around an open kitchen and the namesake hearth, and there's also the private Casablanca Room for 18. Out front is the charming courtyard patio, replete with its own fountain and olive tree. 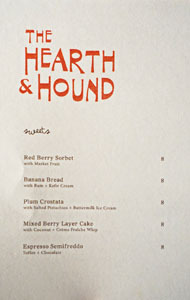 Hearth & Hound's menu is of moderate length, and shows off a Cal-Med slant with an emphasis on vegetables and wood-fired cookery. 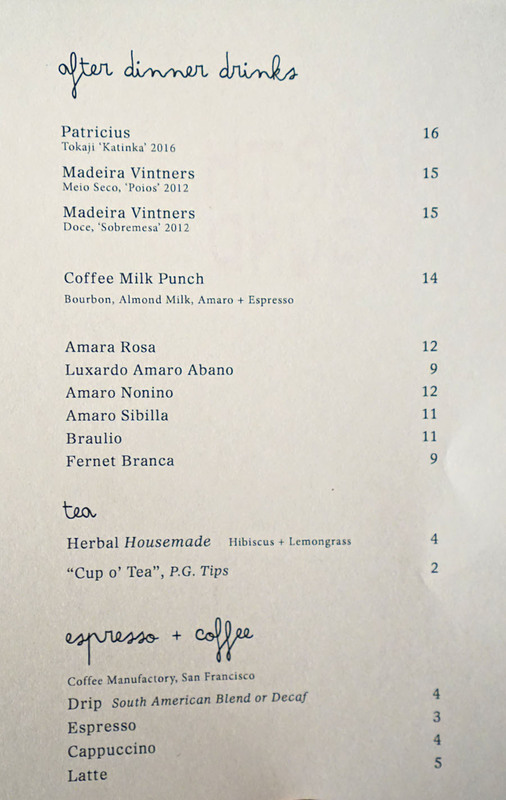 Libation-wise, you get an appealing cocktail list, a smattering of beer, and a mostly Old World wine list. Click for larger versions. 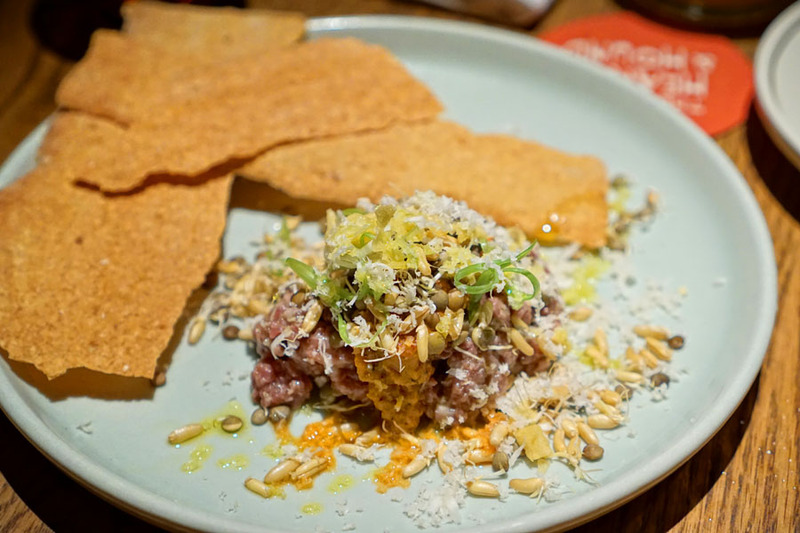 I've had my fair share of beef tartars, and I'll say that this was one of the more venturesome examples I've had. 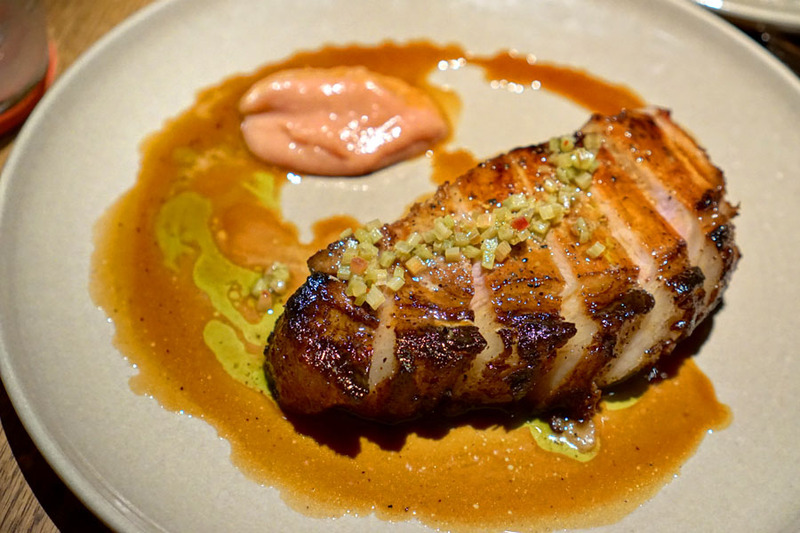 The meat itself ate springy and substantial, and I loved the back-and-forth between the zesty, almost astringent sprouts and the nuttiness of the pinoli, while a persistent harissa-fueled spice bound it all together. Excellent contrast in texture from the crackers, too. A promising start. Next was Bloomfield's take on papas bravas. The potatoes came out well-textured, though the (tomato-based?) sauce they were covered in was a bit too heavy-handed. Fortunately, the included aioli did provide a much-needed balance, and I liked the citrusy kick from the sprinkles of cilantro. To drink, I began with the evening's featured cocktail, which was definitely on the apéritif-y side. It smelled great: bright, citrusy, super refreshing. 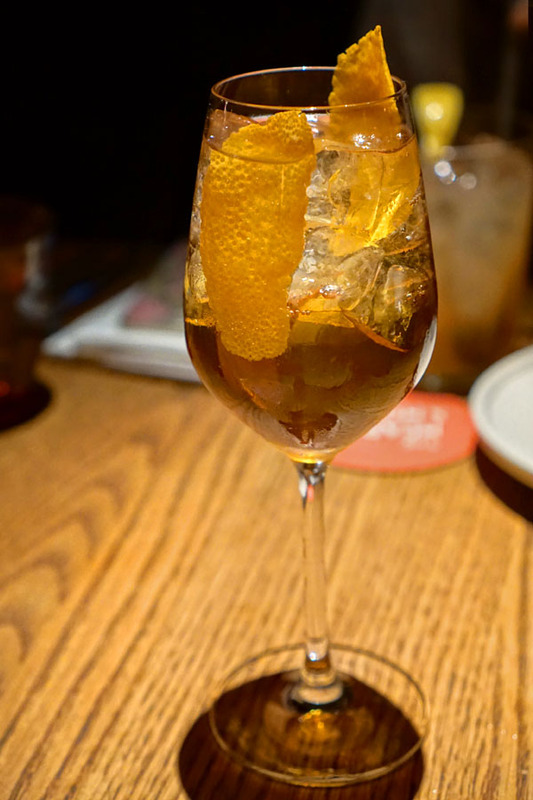 The palate was fizzy, and showcased more citrus up front, joined by dark fruit notes from the vermouth and the sherry's dry, nutty, oxidized nuances. Lovely. 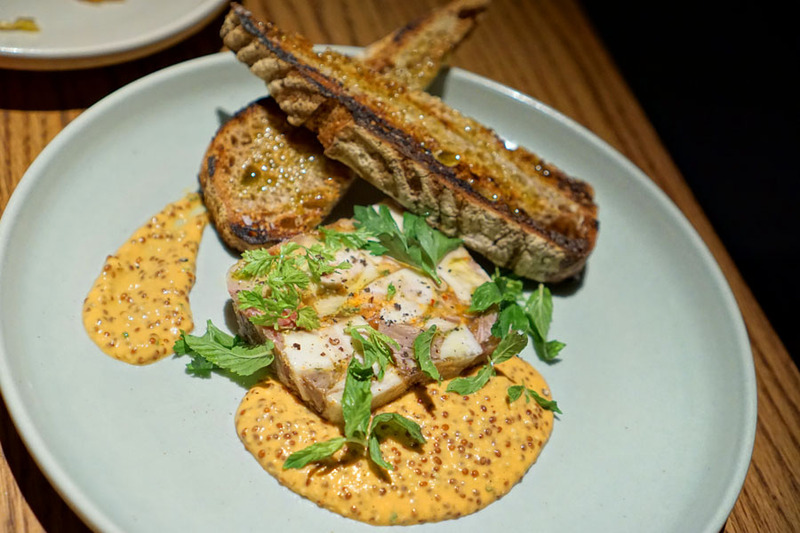 A rustic pork pâté was fatty and flavorful, its considerable heft cut by the zippy combination of mustard and chive. My favorite thing, though, just might've been that bread, with its perfect smokiness, toastiness, and drizzles of oil. Now this was a pleasant surprise. I was a fan of the stone fruit and its perfect marriage of sweetness and smoke, while the creamy, tangy character of the cheese and that crunchy, nutty tuile(?) served as effective counterpoints. Nice peppery accent from the arugula, too. Our next cocktail was a fun one. 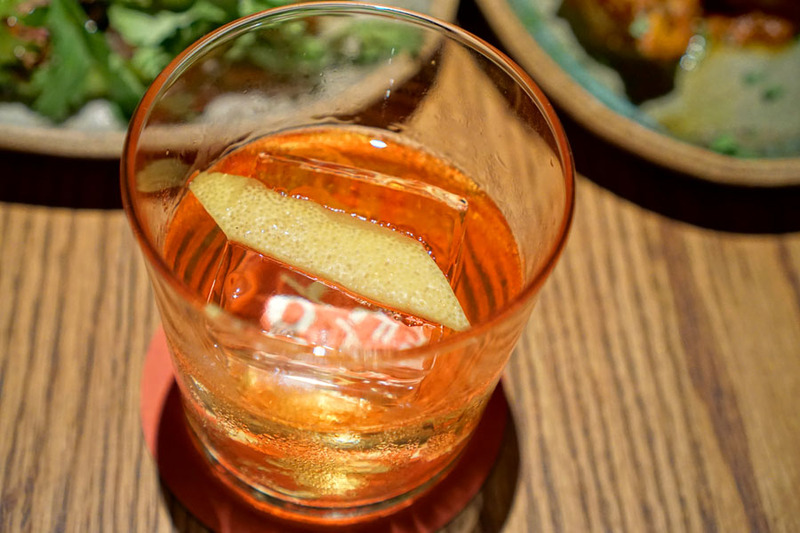 I got massive notes of sweet-tart passion fruit, but this was evened out by the herbaceous nature of the Chartreuse, while the smoky mezcal showed up just a bit. I didn't taste much from the espelette, however. As you probably know, I'm a bit of an octo fiend, so this was a must-order. It turned out to be a winner, and actually one of the more intriguing preparations I've had lately. The octopus was as tender as I wanted, with a great char to boot. What was surprising was the melon, which contributed a refreshing fruitiness that actually made a lot of sense. The finishing touch? A superb pinch of heat from the chili jam. The chicken came out tender and pretty juicy too. It was an aggressively seasoned bird (probably too much so), while the cornichons gave the dish a persistent tartness. The king trumpets, meanwhile, added further oomph and umami, not to mention a bit of textural variation that I appreciated. I pretty much enjoy Earl Grey in all its forms, so this next cocktail was a no-brainer. Aromas were appealing, with sweet, vibrant, apple-like notes dominating. The palate displayed fruity, floral flavors from the tea, commingled with smoke and the unmistakable punch and burn of the whiskies. 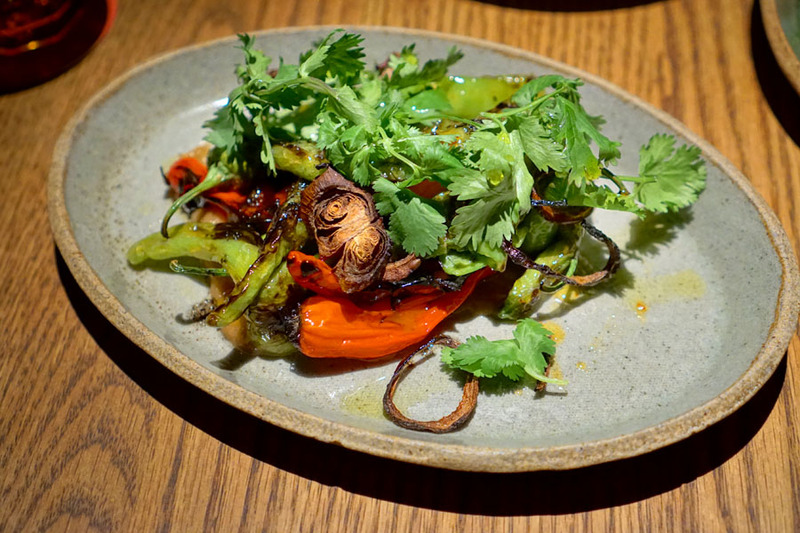 This was another pleasant surprise, and no doubt of the best pepper-centric dishes I've had. The key was how there was a sweetness present that perfectly tempered the prickly heat and char of the chilies. It was a super smart combination, and one made even better by the generous helping of cilantro up top. The pork was just about as soft and succulent as any I've had. It was also unabashedly fatty, and very assertively flavored. The dollop of rhubarb provided a tartness, but I actually could've done without it. 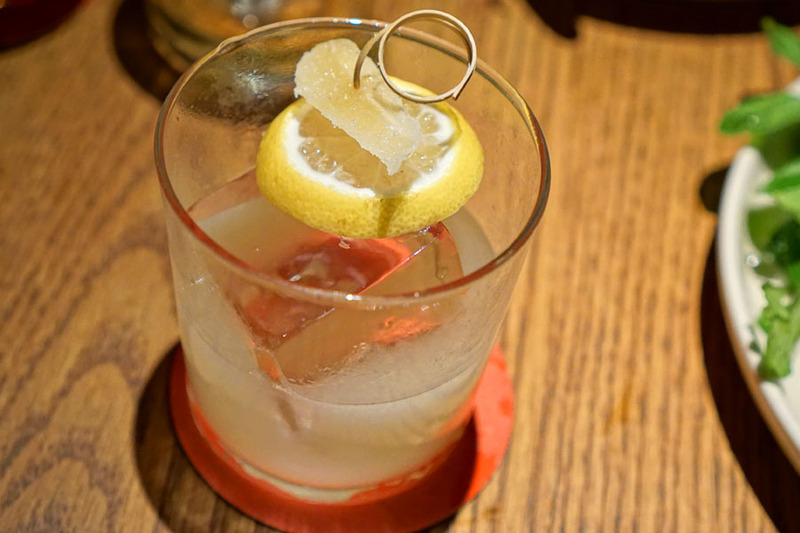 The evening's final cocktail was this Penicillin-ish number. 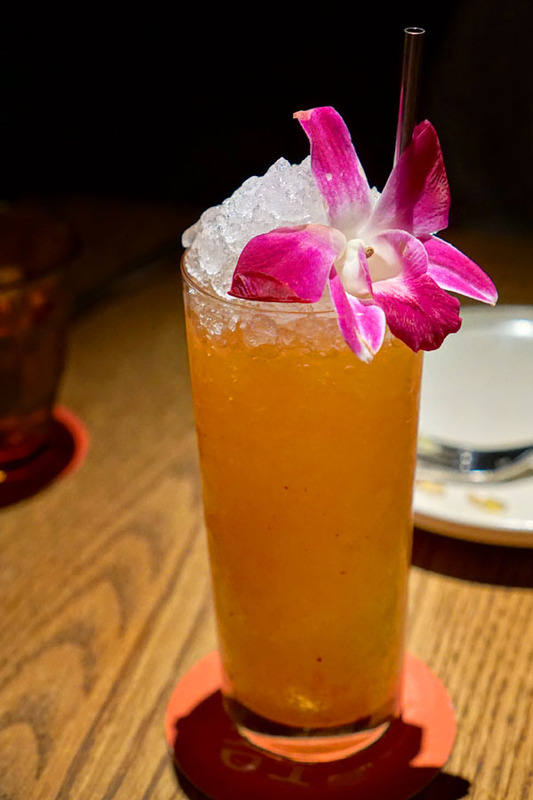 There was a sharp bite from the ginger and lemon, but this married well with the tequila, with all the various elements mellowing each other out. I also detected hints of overarching cinnamon, which was appreciated. There's a small, straightforward dessert selection that pretty much follows the theme of the rest of the menu. Click for larger versions. 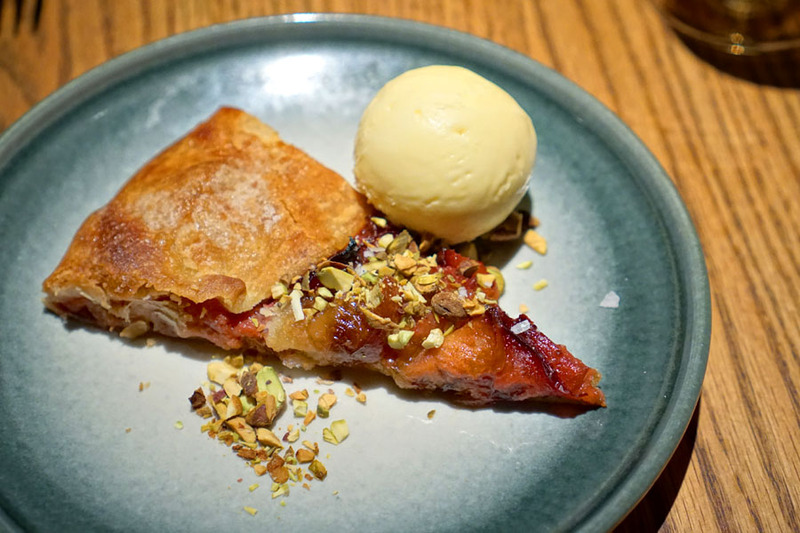 A crusty, rustic crostata deftly showed off the stone fruit in concert with savory bits of pistachio. The ice cream, meanwhile, was superb, and I wouldn't have minded more of it. The banana bread made for a fitting end to our meal. Flavors were dark, heady, fruity, with the additional depth and complexity of rum and a persistent, contrasting bitterness. I quite liked the crunchiness of those banana chips, too. I came into Hearth & Hound trying to focus just on the food, and left pretty satisfied. The cooking sort of blends Bloomfield's brand of gastropubby cooking that she's known for with a decidedly Californian feel: "a little bit of fresh, a little bit of fat" in the Chef's own words. The end result is some robust cuisine that doesn't hold back and works most of the time. 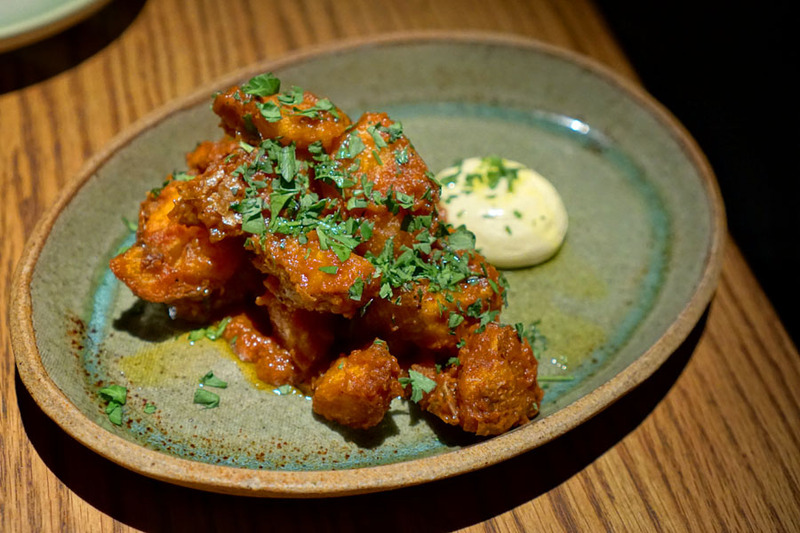 All controversy aside, this is a solid addition to the Hollywood dining scene, and LA overall. So Mike D is out? Oh well - food looks good though. Dang! There are people that still won't go. Hopefully people will give it a chance now that a developments makes it possible.